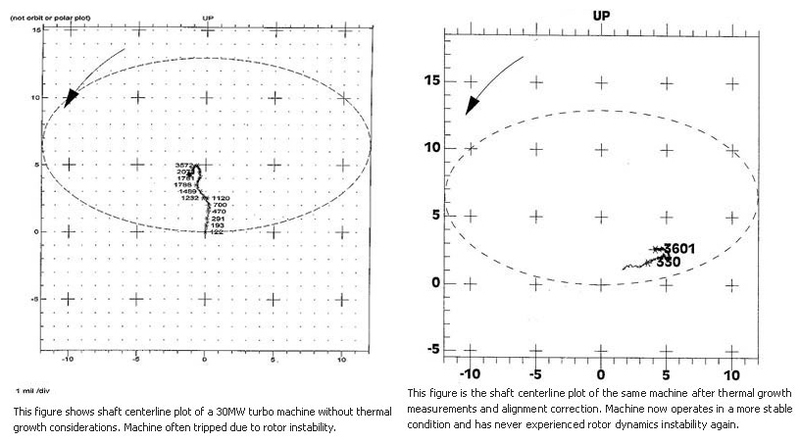 Many steam turbomachines are forced to operate for years with a reduced capacity due to excessive and unstable vibrations simply because they were aligned with inaccurate thermal movement values. Often steam turbomachines trip with unstable and excessive vibrations before they reach their full loaded power; just after they have gone through a scheduled overhaul. This occurs because the installer has used specified OEM thermal movement values that do not apply for the specified setup, or used incorrectly estimated thermal movement values in the cold alignment of the turbomachine. Typically, the agonizing trial and error alignment efforts to stabilize the turbomachine in previous overhauls were not documented and recorded. Thus the turbomachine installer was not aware of the previous history and followed standard alignment procedures, which did not work in previous overhauls. In many cases severe vibration problems exist for many years, resulting in heavy financial losses due to the forced reduced operating capacity to keep the turbomachine online, and due to abnormally high maintenance costs caused by premature mechanical failures. IN MANY CASES, ELIMINATION OF THE ROOT CAUSE OF THE UNEXPECTED TRIPS AND ABNORMAL VIBRATION LEVELS IS AS SIMPLE AS CORRECTING THE SEVERE HOT MISALIGNMENT! Fully appreciate the difference between vertical thermal growth and full X, Y and Z thermal movement values (steam turbomachines do not just thermally grow vertically; they thermally move in X, Y and Z directions due to pipe stresses, floor and soil movements, etc.). Correctly diagnose the severe hot misalignment condition. Perform an accurate 3D thermal movement analysis to determine the precise X, Y and Z thermal movements of the turbomachine from the COLD STATE to the HOT STATE. Most existing thermal movement technologies, techniques and procedures are flawed with many assumptions that are not valid in real field conditions. Their measurement approaches are plagued with major measurement errors that cannot be checked scientifically. Reality Measurements can perform advanced machine dynamics measurements to conclusively prove if a steam turbomachine is operating with a severe hot misalignment and has developed a unique geomatics technology (targeting, software and procedures) to precisely measure the X, Y and Z thermal movements of a steam turbomachine. The final thermal movement results are statistically and scientifically supported to conclusively prove that the X, Y and Z thermal movement values are accurate. 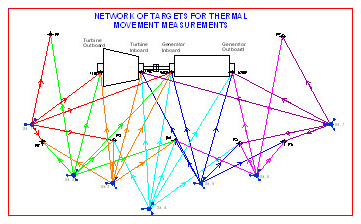 This has resulted in the completion of many highly successful projects which conclusively show significantly improved hot operation orbits and design-like shaft centreline plots after the turbomachine was aligned with our accurately measured X, Y and Z thermal movement values. We invite you to read our technical paper, written by company President Frank Perricone, presented at the Vibration Institute Annual Meeting in Louisville, Kentucky in June of 2006. Accurate and provable xyz values to .001" - .002". Many measurements of same point are taken at different angles which provide a redundant and statistical sample of data which will assure the accuracy of the measurement. All 3 directions are measured (i.e. not just vertical). Not only can data be statistically proven to be accurate but the shaft centerline analysis of the machine's train on a runup will conclusively prove the normal shaft position in the bearing.